Silky-smooth, rich, and creamy sour cream – with not a lick of dairy! 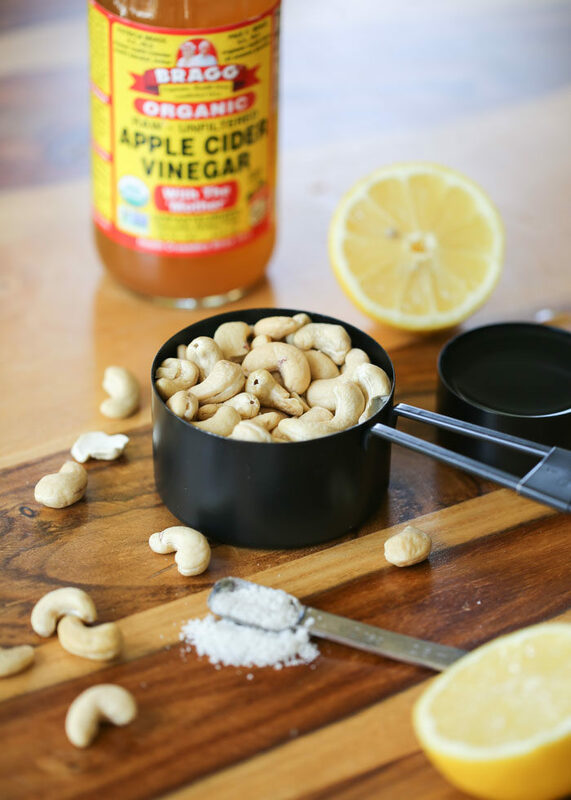 Only 5 ingredients – cashews, lemon juice, apple cider vinegar, salt, and water – will get you there. 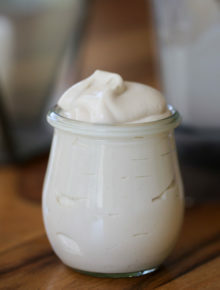 A batch of this vegan sour cream is in our fridge 24/7! I can confidently say you’ll be blown away when you try your first taste of this vegan cashew sour cream. At least, if you’re anything like me. Because holy yum. If you’ve been avoiding dairy, you might think to yourself, “Holy crap – this is what I’ve been missing. This is life-changing. LIFE CHANGING!! !” You might also do a happy dance – a literal one that’s sort of a combination of that classic Flashdance scene and Snoopy kicking his feet like a bunny. I mean, if you’re anything like me. 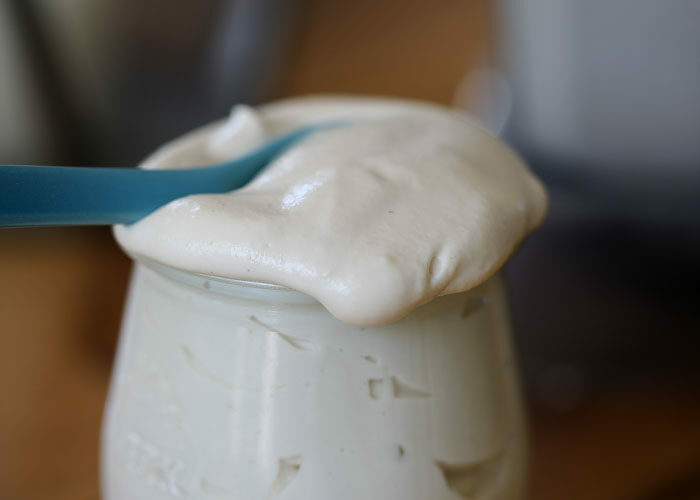 Cashew sour cream is super DUPER easy to make, and guys. It is SO good. 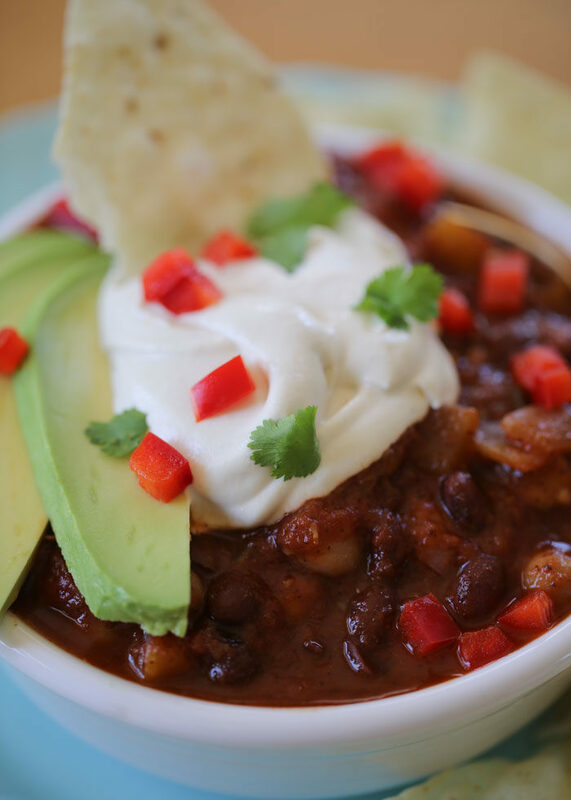 Plopped on chili, served up with quesadillas, plopped on nachos. Basically, you’ll be doing a lot of cashew sour cream plopping when you make this recipe. It’s totally plop-worthy. It’s also silky smooth and – with lemon and apple cider vinegar lending a good amount of tartness – really does taste a lot like sour cream. You’ve probably at least heard of cashew sour cream by now, but if you haven’t, let me assure you that I am definitely not the brilliant mastermind that came up with the idea. I’ve been making it for years – well, over two, to be exact – since I had to cut dairy from my diet. 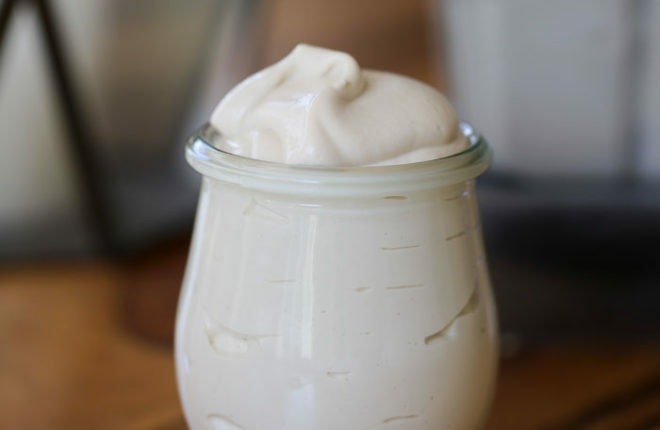 I don’t remember where I originally saw the idea that has gradually morphed into my own cashew sour cream recipe, but the earliest instance I can find online is here, on a blog called Gluten Free Bay. So what’s in cashew sour cream, you ask? Well, cashews, of course. Soaked in water to soften them up and ensure a nice, smooth consistency when pureed. Then, you add lemon juice and apple cider vinegar for that classic sour cream tang. Then some salt for savoriness. And a bit of water. 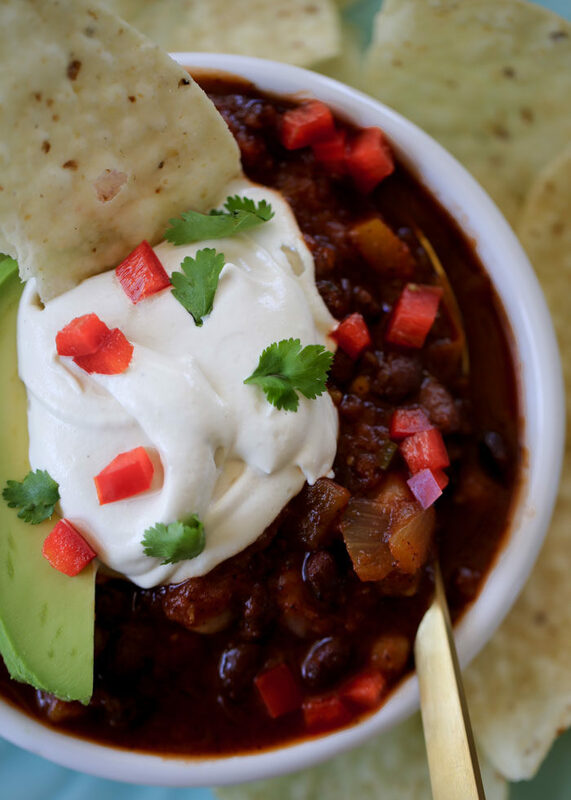 Then puree the heck out of all of it and watch it come together into a glorious substitute for sour cream that’ll make your dairy-free days so much more pleasant. Especially when a bowl of chili is involved. 1. Choose the right cashews. We’re talking raw, unsalted, whole cashews. That’s it. This is so they blend up all nice and smooth and perfect. You can do the quick-soak method or the not-so-quick-soak method. Quick soak: Pour about 3 cups of boiling water over 1 cup of cashews. Let soak at room temp for 15 minutes. Not-so-quick soak: Pour 3 cups cold/tepid/lukewarm tap water over 1 cup of cashews. Let soak at least 2 hours, up to 18 hours (any longer than that and you should refrigerate). 3. Drain and rinse the cashews. 4. 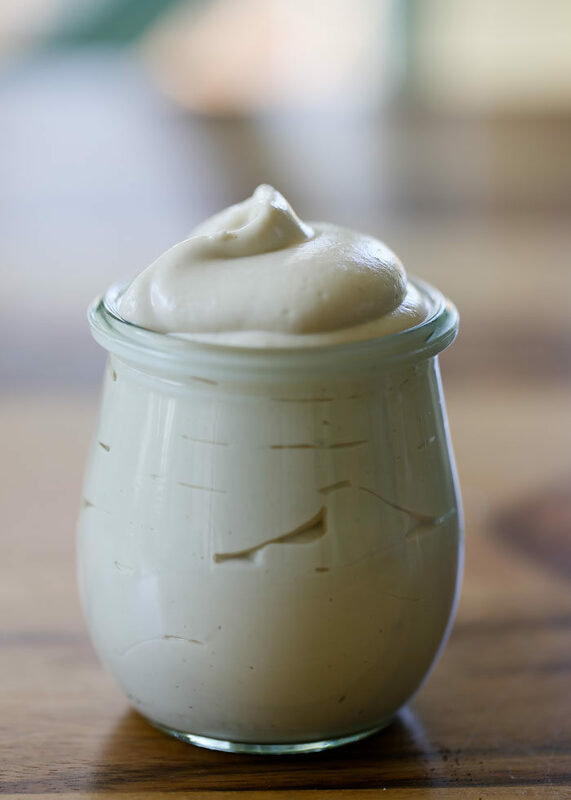 Transform those cashews into cashew sour cream! 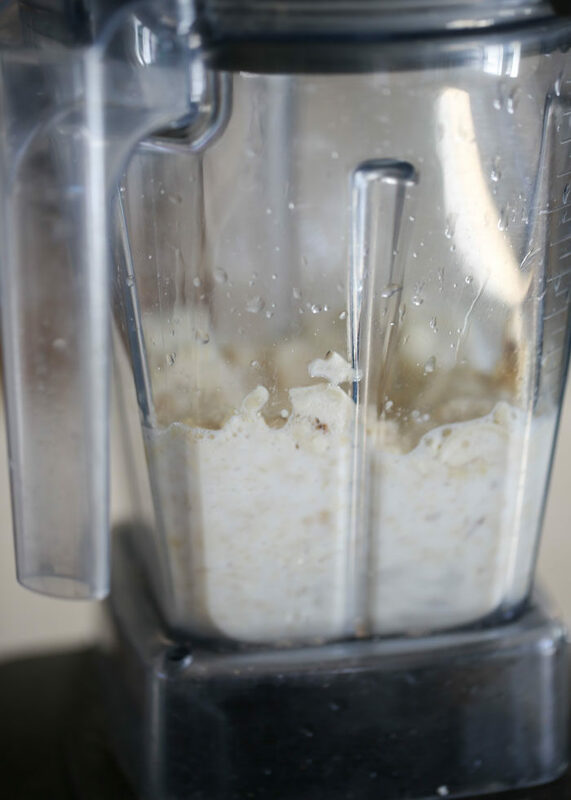 Add 1/3 cup water, 2 tablespoons lemon juice, 2 teaspoons apple cider vinegar, and 1/2 teaspoon sea salt to a high-speed blender (like a Vitamix) along with the soaked cashews. Then puree for about a minute until it’s silky smooth. Mixing it all together. About halfway there! By gosh, you’ve done it. Delicious, right?! Here’s the full-blown, printable recipe. Happy plopping! Soak cashews in at least 3 cups of water. For a quick soak, pour 3 cups of boiling water cashews. Let soak at room temp for 15 minutes. For a not-so-quick soak, pour 3 cups cold/tepid/lukewarm tap water over 1 cup of cashews. Let soak at least 2 hours or up to 18 hours (any longer than that and you should refrigerate). 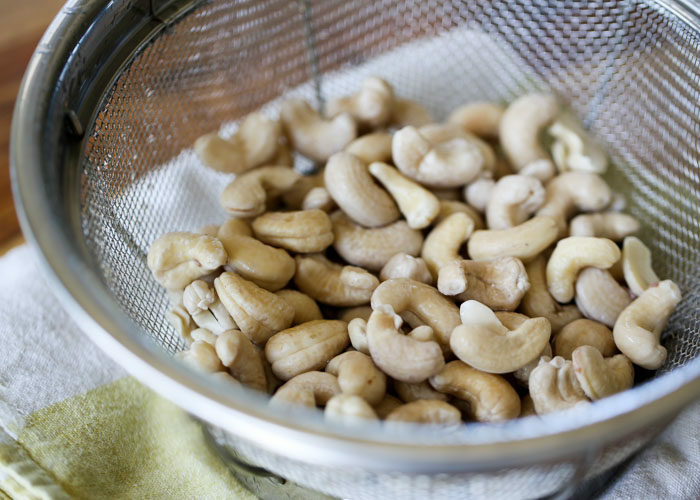 Drain soaked cashews in a colander or sieve and rinse with cold water. Place soaked cashews in the pitcher of a high-speed blender along with the lemon juice, vinegar, 1/2 teaspoon salt, and water. Puree on max speed until completely smooth, 1-2 minutes. Taste and add additional salt if desired. Sometimes I like to add another teaspoon of apple cider vinegar if I’m looking for some extra tangy tang. Keeps in refrigerated in an airtight container for 4-5 days. You can also freeze it – score! Yay!!! I’m so glad you like it as much as we do! WOW ! Wonderful idea to use in so many ways ! Thank you !